A couple of weeks ago I posted about my mag destruction, i have it all apart and am starting to install the new parts, I had a spare 25 assembly with a new brake drum, I have a new mag ring from R V Anderson so all is well on the replacement, I thought you would like to see the aftermath of this failure, i am glad we were not driving it on some tour in the middle of nowhere. It even sheared off the mag post, all of the magnet keepers are bent and chewed up, the spools are a mess and most of the 3/8" bolts are bent or broken. the magnet parts are from the 14 broken magnets.This gives me something to do this winter, while fitting the flywheel and getting the proper spacing I had a problem with the new unit when I lifted the unit up one of the mag screw heads broke off as the keeper stuck to the mag ring, so I took all these magnets off and I will recharge them and use new screws and spools, one thing leads to another. Thats my sad tale for today.. I have a bushel basket if you need it. This looks real bad, and it is. But a lot worse could have happened. Sometimes when the trans/mag lets go it could hurt the driver. 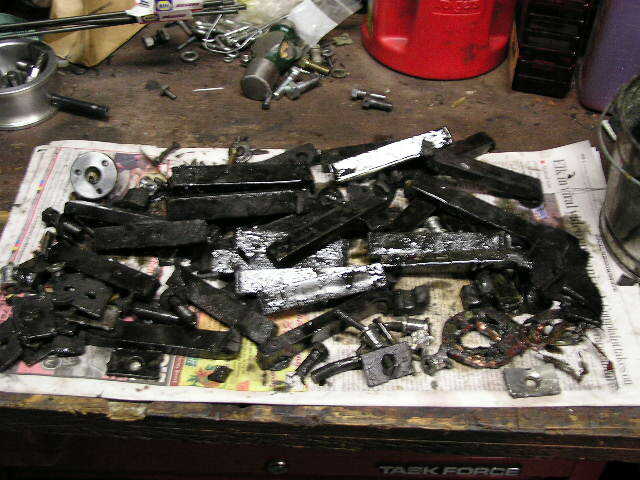 I helped rebuild a TT truck engine several years ago that had exploded. The owner was towing the truck. He said they were going about 30 mph. Which is way to fast for a TT. That may explain the destruction that happened. When I got the truck and the parts this is what I had. The hogs head was in 5 pieces. The mag ring was broke in 3 pieces. The flywheel was broke in 1/2 and the ring gear also was in 1/2 The trans drum assembly was picked up from the highway. There were 2 triple gears and the third one was gone. But there was a hole in the door that a triple gear would fit thru ?? The wood firewall was just splinters, the coil box looked like it had been ran over by a truck, the floor boards were in splinters also and the entire inside of the cab was covered in dirty used motor oil. Even under the seat cushions. The bottom of the oil pan looked like someone with a steel claw chewed it up. and the snout of the starter had been broken off. I never saw anything like it. It made me start to wonder if that kind of damage could happen while driving a T. From what I saw in that truck I can not believe a person could have lived thru it, or at least lost there legs. I know they were towing it, but has anyone else seen that kind of damage. I still have a few of the broken parts to remind me of that truck. 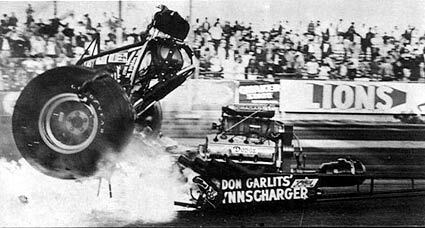 Transmission explosions can be nasty, just ask Don Garlits, this one blew part of his foot off! That looks like either a Arden overhead or a Hemi. In the 50 all dragsters and modified cars had to have a flack shield over the fly wheel area before the could race, do you wonder why.